The peak epoch of star formation in the Universe, about 10 billion years ago, marked a time of vigorous stellar mass growth for most galaxies. This star formation activity was likely fueled by the accretion of relatively cool gas from either the cosmic web or from the large reservoir of neutral gas that surrounds most of these galaxies. However, a sizable fraction of massive galaxies at such early times formed stars at a significantly reduced rate. Above: A star forming galaxy at z~1.7 in the MassiveFIRE sample. Left: Stellar light in rest frame U, V, and J broad bands. Right: Gas density, temperature, and metallicity. Top panels show the stellar and gas disk of the galaxy in a face-on projection. The bottom panels show a zoomed-out view of the same galaxy. Which physical processes are responsible for the quenching of star formation in massive galaxies? What is the structure and composition of the halo gas surrounding massive galaxies? What are the physical conditions and the origins of sub-millimeter bright galaxies? How are star formation, stellar feedback, gas inflows, and outflows interconnected? How did the super-massive black holes at galaxy centers form, and how did they grow? How does the growth of these black holes impact back on their host galaxies? 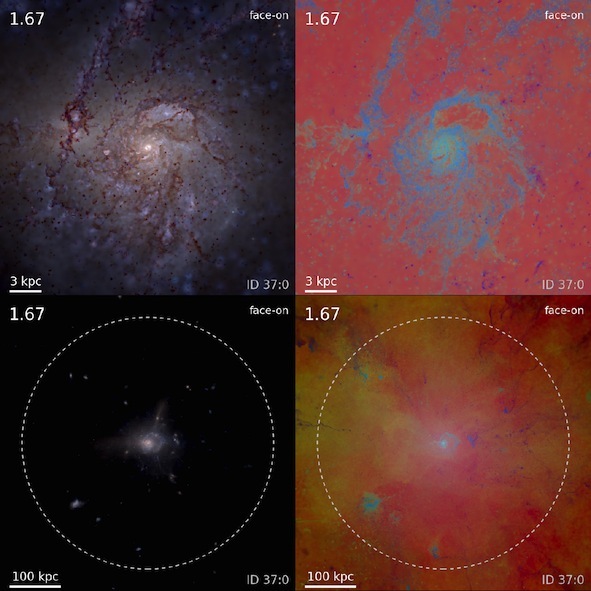 MassiveFIRE is a suite of FIRE project simulations, an ensemble of simulations chosen to have initial conditions targeting specifically massive galaxies to address these questions. The sample has been introduced in Feldmann et al. 2016 and is described in more detail in an upcoming publication (Feldmann et al. 2017). In addition we’ve simulated large ensembles of massive halos at higher redshift to study re-ionization (Ma et al. 2017) and at low redshift (in prep). An area of active development for the FIRE project is simulations of massive galaxies including supermassive black hole growth and feedback (e.g., Anglés-Alcázar et al. 2017). Our GIZMO code has detailed physics for multi-wavelength radiation hydrodynamics including the effects of black holes photo-ionizing and Compton heating the medium around them, as well as accretion disk winds and relativistic jets, cosmic rays, and more. However, unlike feedback from stars, which are relatively well-understood and have extremely well-studied stellar evolution models to provide the “inputs” for FIRE simulations (e.g. supernova rates), black holes remain poorly understood, so the initial explorations with FIRE are oriented towards better understanding the micro-physics of black holes and active galactic nuclei (AGN).